After one week, there has been a noticeable change in Prime Time Sports Talk’s NBA Power Rankings. Sleeper teams have come out of nowhere to shoot up the rankings, while powerhouses are still trying to either round into form or get healthy in order to catch up after an early slide. Without further ado, let’s get into the rankings. The Warriors remain the leaders in the rankings after one week. Newcomer Jonas Jerebko already has a game-winner to his name just three games into his Golden State career, and it looks like the Warriors are back up and running as Steph Curry continues to pace the best team in the Association. Everyone not north of the border slept on the Raptors. 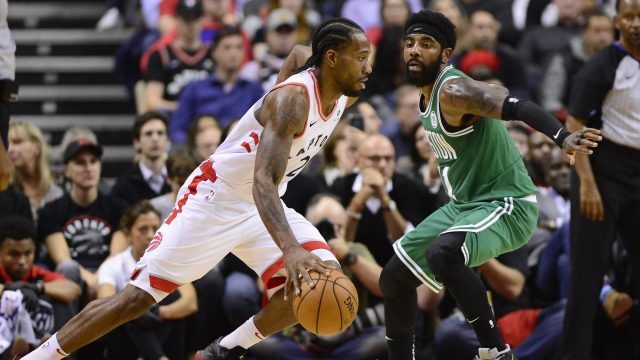 Boston was the betting favorite to make it out of the East, but Toronto is starting to sway public opinion. Kawhi Leonard is back to looking like every inch of the Klaw that he is, and the Raptors still have a loaded bench and a legit second option in Kyle Lowry. The punctuation mark for the Raptors was an early statement win against the Celtics Friday night. Look for them to make some noise in the East this year. The Celtics have yet to put it together four games into the young season, but there is still no reason to worry. The Celtics are the deepest team in the NBA. But Kyrie Irving and Gordon Hayward need to get back into their shooting forms, then fans can see what the Green are really made of. The Pelicans are averaging 140 points in their two games thus far. Let that sink in. Anthony Davis is on fire to start the season, and the team in the Big Easy looks to have not missed a step following the departures of Rajon Rondo and DeMarcus Cousins. I didn’t think the Pelicans had a chance to make the playoffs, but if their offense continues this prolific output they have a chance to make noise in the West. The Nuggets are one of five undefeated teams remaining and boast perhaps the most signature win of the year with a win over the Warriors. Juan Hernangomez block sealed a late win for Denver, and the Nuggets finally appear ready to make the leap that many have predicted. One inhibitor of that? Guard Will Barton is expected to miss 5-6 weeks after undergoing hip surgery. Isaiah Thomas watch is officially on in the Mile High City. The Jazz almost came away with a win against Golden State if not for Jerebko’s buzzer beater. They suffered a tough loss against Memphis, but that doesn’t change the fact that this team and Denver are the best two teams that no one is talking about as a result of their small markets and relatively starless roster. The Sixers suffered a humiliating defeat at the hands of the Celtics opening night but have rebounded to win two straight. Ben Simmons and Markelle Fultz still can’t consistently shoot, so Joel Embiid will probably have to be relied upon even more this season. The Sixers are a very good team but are a clear third behind Boston and Toronto at this point. The Rockets struggled with what everyone and their grandmother knew they would for the first three games—defense. Houston doesn’t have a prayer of catching up with Golden State if they can’t overcome the losses of Trevor Ariza and Luc Mbah a Moute. Chris Paul is suspended two games for his incident with Rondo Saturday night, but that may be a blessing in disguise. The Rockets need Paul at his peak in May and June, and every extra day off during the season helps him get there healthy. The Spurs were only ranked so low in the first power rankings because I didn’t know how they would fare against teams that shoot the three well when their two best players’ games are based around shooting from inside the arc. Like the New England Patriots, the Spurs have proved them wrong. They faced quality competition in each of their first three games and beat the Lakers and Timberwolves while falling to the red-hot Blazers. The Blazers are ranked below the Spurs for the time being just because they lost to the Wizards in overtime at home. The Blazers are still on fire, with Damian Lillard and CJ McCollum doing their usual regular season things. One surprise? Guard Nik Stauskas, who shot the lights out against the Lakers opening night and is averaging 14 points on the young season. These two squads have come out of the gate slowly and with the Thunder looking for their first win Thursday it should be exciting down in Oklahoma City. One comment on "NBA Power Rankings: See Who’s up and Who’s Down"